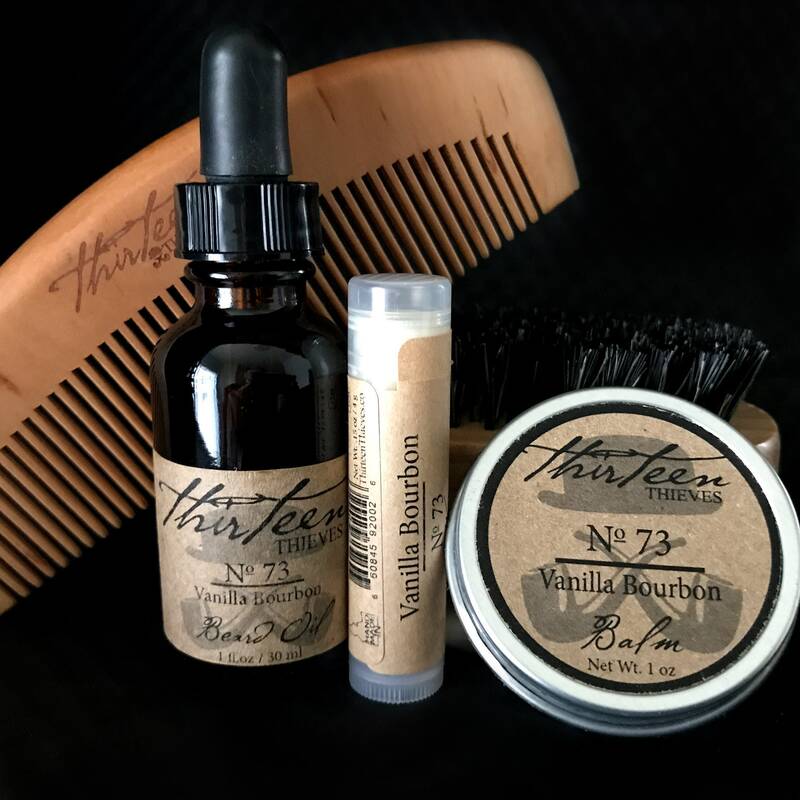 The Thirteen Thieves Ultimate Beard Grooming Kit comes with everything a man needs to have a fantastic beard care experience. 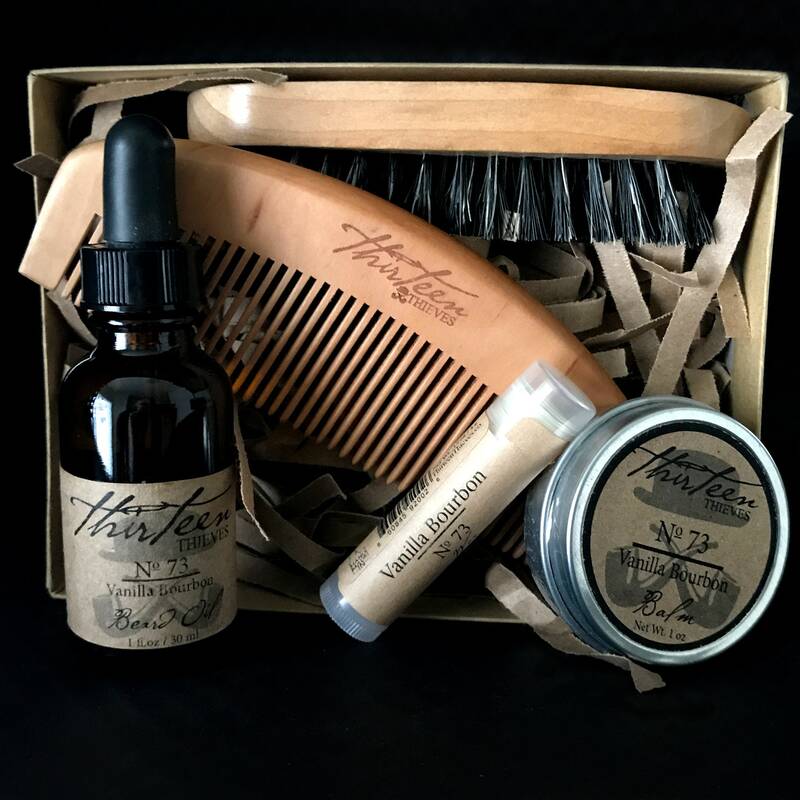 Make maintaining healthy facial hair and skin easy with this gift set which pairs our natural, handmade beard balm and oil products along with high-quality grooming tools. 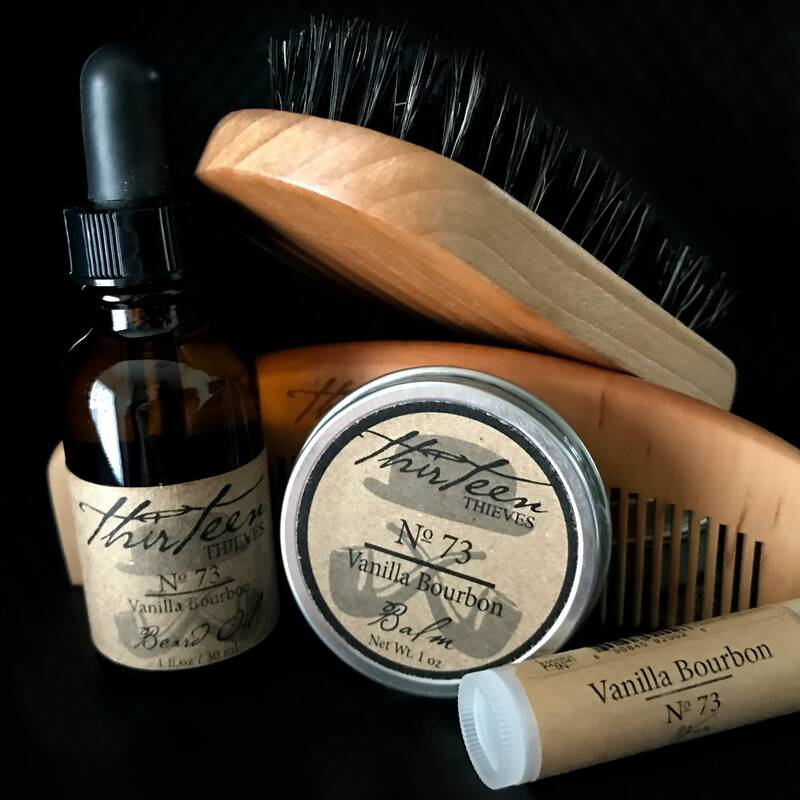 The Boar Bristle Brush make shaping a breeze while the included beard comb helps to distribute the oil or balm through your beard to keep hair well-groomed and give it a healthy shine. 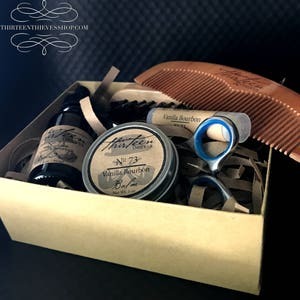 This comprehensive beard care kit is the perfect holiday present, groomsman, or best man gift for any wonderfully bearded man. Buying this as a gift? Add our $5.00 gift wrapping option during checkout, and your beard kit will arrive wrapped in gorgeous metallic gingham paper with gold cord ribbon and a gift tag. • Natural Orange No 01: Men and women love this fresh, light, and tangy scent. Receive an energizing and uplifting boost to your daily routine when you choose this blend of orange essential oil, juicy grapefruit, and crisp bergamot. •Wooded Spice No 29: Fall in love the minute you smell the robust, masculine combination of pine and clove essential oils. Eliminate itching and irritation with this spicy, balanced scent that will energize your attitude while giving a healthy shine to any otherwise lifeless beard. • Rich Forest No 34: We recreate a magnificent forest experience with pine, juniper, and cedarwood balanced with rosemary and mint to harmonize your spirit. These essential oils combine with our base formula to create a cool, manly scent and soften hair along with the skin hiding underneath. To fulfil your order, you must provide us with certain information (which you authorized Etsy to provide to us), such as your name, email address, postal address, payment information, and the details of the product that you’re ordering. You may also choose to provide us with additional personal information (for a custom order of jewelry, for example), if you contact me directly. We do offer our products for purchase through wholesale. Please contact us so that we may provide that information to you. •Our products will Decrease Skin Dryness and Alleviate Itching and Irritation. •The oils we use are Detoxifying and respected for their Purifying qualities. •These products are high in Omega 3 and Omega 6 to maintain Strength and Beauty. •They are an Exceptional Moisturizer for Skin and Hair. 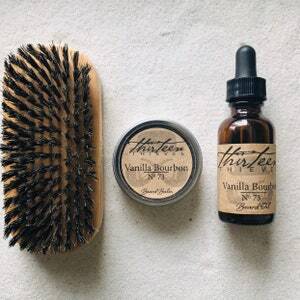 •Your Beard will be Softer Naturally. 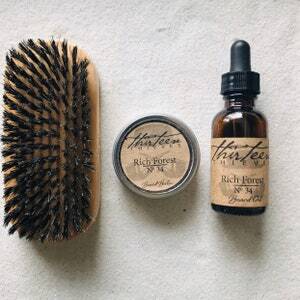 •These Oils will give Shine and Manageability to those dull, lifeless beards. •Used continuously, experience the Regenerative and Restructuring properties to the hair. •You will see your beard health increase with the repairing of damaged hair these oils provide. •Fights beardruff (white flaking) and the Dryness of the skin behind the beard. •Feel confident and look your best. With so many products to choose from how do you decide or discern one from the other? We spent countless hours on research as to what made a superior beard products. We read books, articles, essentially anything we could find from historical usage data to the newer holistic medicinal perspectives. Based on all the available information, we decided to incorporate as much of that information we felt provided the most optimal results into our products, which is reflected in our current blend. Please contact us before ordering if you have allergies to certain ingredients. Test for allergens on a small patch of skin before using. May contain nut or tree nut oils. Keep out of reach of children. Not for consumption or internal use. Do not use on open wounds. Discontinue use if irritation occurs. Do not store in hot or humid conditions. We designed all of our products to avoid having harmful fillers like parabens, phthalates, sulfates, or synthetic dyes. There are so many things that have been linked to adverse side effects, like skin sensitivity, neurotoxicity, and cancer. Some of those fears may not matter in the here and now, but in the future, after long-term exposure, they may be an issue then. Until then we do not want to take the chance, we have enough things on our plate to worry about, and what's in my product may not be your first thought when you make up in the morning. If you use our products, know we are shielding you from those harmful chemical additives. You may not thank us, but your sub-conscience will. Your satisfaction is important to us. If you are unsatisfied with your purchase, we are happy to exchange your product. Exchanges are only accepted within ten days of the purchase date and are only available for the unopened and unused product. If the seal is broken, we cannot accept a exchange. Prepackaged kits are ineligible for refunds. ThirteenThieves Mustache Wax tubes are made from a Polypropylene plastic, or #5, and is the material choice for lip balm tubes and other sorts of everyday plastic packaging such as yogurt and hummus containers due to its versatility and flexibility. #5 plastic is one of the most benign plastics and can be easily recycled and reincarnated into new products. The Cherrywood Comb is made of 100% cherrywood. The design of this Cherrywood Comb and the tines are made from natural materials that can break at any given time. Daily usage of combing through the hair on the head that is thicker and or tangled can break the tines along with dropping the comb on a hard surface. The comb will have no issues with tines breaking during normal usage of beard hair. Unfortunately, I am not able to guarantee that any purchase will not break due to misusing the comb.